I wish I could remember what song was playing when this picture was taken. What's funny about this is that Rajan looks completely calm and collected, whereas I am pink-cheeked (shall we blame the stage lights or the Kingfisher?) and bewildered (but having a wonderful time), which is not at all a bad summary of much of the trip. 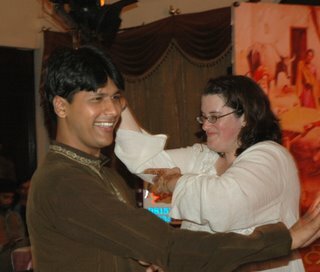 Now, obviously this is not at all a flattering picture, but I'm postoing it because 1) maybe this will sate Michael and Babasko, who wanted footage of me dancing as an extra in a Bollywood-style number in a local independent film, and 2) it was a superwow evening that truly should be documented. Is that henna on your hands? You look like you are having TOO much fun!!! aur mehendi bhi! very very cool! if you were trying to scare me away from our dance-off...you succeded. I know now I will loose. Ok. You can have Inder too. It is indeed mehendi! My cool friend from the Times of India took me to have that done the third day I was in India. It was so cool to watch the woman do it - such an artist. I fear that the insane amount of sweating I did in India made it wear off too fast; although it could be that I didn't set it quite properly, despite having lemon juice from a fresh lemon that Debbie sweet-talked out of the bartender at the hotel bar. Oh no! She can do the balle-balle! And turn all rosy-cheeked while at it! Darn it! Must think of something to up that! Now I'll have Balle Balle from Bride & Prejudice stuck in my head all day. Which is not a bad thing at all!